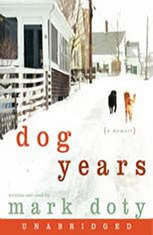 Dog Years. by Mark Doty. 216pp, Jonathan Cape, £11.99. Mark Doty was walking his arthritic dog through Manhattan when a passerby paused to pet the black retriever. Why do dogs speak so profoundly to our inner lives? When Mark Doty decides to adopt a dog as a companion for his dying partner, he finds himself bringing home Beau, a large golden retriever, malnourished and in need of loving care, to join Arden, the black retriever. Other memoirs by Doty includes Firebird (HarperCollins, 1999), Still Life with Oysters and Lemon: On Objects and Intimacy (Beacon Press, 2000), and Dog Years (HarperCollins, 2007). He has also edited The Best American Poetry 2012 .